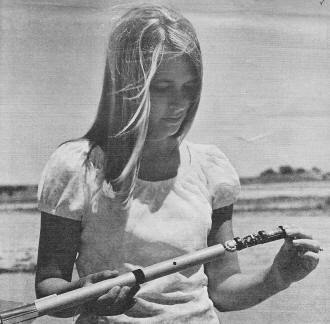 Airplanes and Rockets website visitor Dan V. wrote asking that I scan and post this article on the TRANSROC from the June 1971 edition of the Estes Model Rocket News publication. 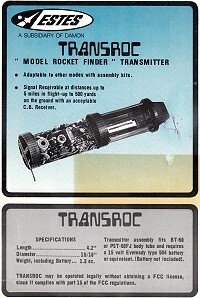 It did note present any technical information, but fortunately the entire very detailed TRANSROC User's Manual is available on the SpaceModeling.org website. "Hey, this is GREAT!" Can't you just hear your friends when you fly your model rocket with the Estes TRANSROC--the latest in miniature Space Age electronics? You'll have lots of fun, too, becoming an expert with this multi-purpose transmitter that will literally transform your model into a "talking bird." Jo Angel, a member of the Estes Rocketeer Communications Department staff, is shown placing a TRANSROC (in the microphone mode) in the payload compartment of a rocket. Hole in payload section is for tuning antenna-matching coil. You can start by using the TRANSROC as a rocket finder-- its most basic mode - - to retrieve lost birds using your walkie-talkie. Then as the TRANSROC bug bites you, you can add sophisticated Estes TRANSROC accessories that will bring you even closer to being a real space scientist. The TRANSROC is just over four inches long and fits neatly in a BT-50 paper body tube (or PST-50 FJ clear plastic body tube), and can easily be adapted to larger rockets. It is powered by a 15-volt battery with a life of up to 24 hours and transmits on any of the 23 channels in the 27 Megahertz (megacycle) Citizens Band which you specify. Normally, the crystal supplied will be Channel 11 or Channel 14 to match the walkie-talkie units available from Estes. No FCC license is required to operate the TRANSROC. Detailed and thoroughly illustrated instructions on assembly, theory, and operation are supplied with the Estes kit. If you have previous experience building electronic devices, you can assemble the TRANSROC yourself. If not, you may prefer to purchase a pre-built TRANSROC. In its basic rocket-finder mode, the TRANSROC emits a "beep" which, depending upon the level of interference present and the sen­sitivity of the receiver used, can be picked up at distances of up to five mile s or more during flight and up to a few hundred yards after landing. Once you have mastered the operation of the basic TRANSROC transmitter, you are ready to add any of the accessories that will give you many hours of educational enjoyment. You become highly involved in the flight as you listen to your rocket send data back to its own "Mission Control" on the ground. Using the transmitter's printed circuit board, you can, for instance, add a miniature microphone and record in sequence from your receiver the sounds from on board the rocket: countdown, lift-off, coasting, para­chute ejection, descent, and landing. Playing the recording back at your next club meeting will make a hit. Another accessory for the TRANSROC is a spin-rate sensor that tells you how fast your rocket is spinning as it streaks upward. There is also a temperature telemetering kit. The TRANSROC possibilities are not limited, however, to the Estes accessories. Let your imagination run free! Designing and building your own telemetering components for use with the TRANSROC can give you an even greater feeling of achievement in the ever expanding field of model rocketry.